Design of all new buildings in California, including schools, will be required to meet zero-net energy standards by 2030, but we have a large stock of older school facilities that will continue to consume water and contribute to greenhouse gas emissions for the remainder of their useful lives. Our initial structural investment in these building is still viable, but the building systems perform poorly in terms of energy and water consumption. In addition, many of these schools are outdated as educational environments and do not reflect current thinking in twenty-first-century learning. We have an opportunity to revitalize these facilities as learning environments, and transform them into icons of the sustainable future. School facilities should exemplify the values we wish our students to carry into the future. Sustainable futures are a core value of Hamilton + Aitken Architects, and we are proud to have been selected to participate in the 7x7x7 Design Energy Water program. Last week, Amy Fisher and Chad Hamilton presented our case study at the Crest Theater in Sacramento, in conjunction with the annual schools facilities conference. We explored the transformation of older schools to use net-zero energy and water while improving their quality as educational environments. The presentation was the latest in a series, including presentations in San Diego, Los Angeles, San Luis Obispo and Berkeley. 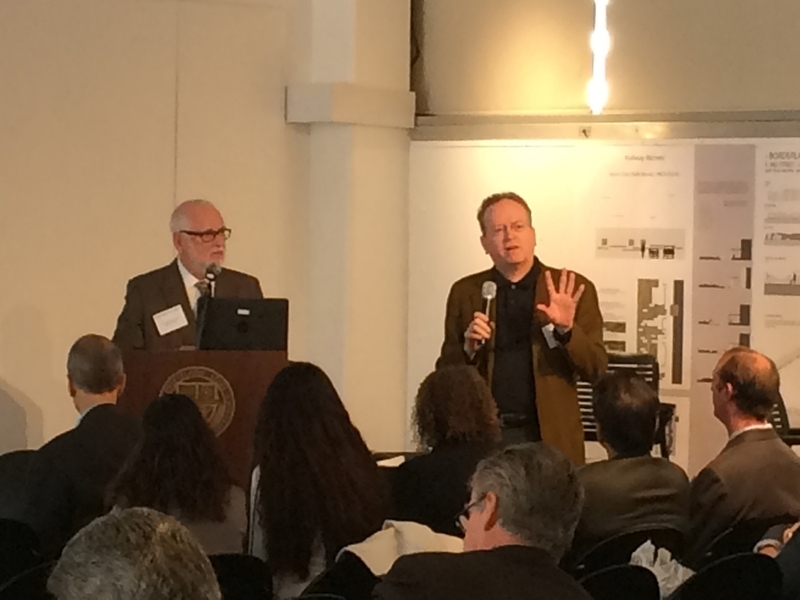 The road show included seven case studies of different schools, each presented by a different architectural firm. 1. Identify the largest energy and water uses. 2. Analyze the big picture, including human performance and comfort. 3. Identify what schools could do right now to clear a pathway for the future. 4. Build upon initial steps by blending passive and active energy and water saving strategies. 5. Finally, implement the transformational last step to achieve zero-net energy and water use. We examined pathways for schools built as long ago as the 1920’s to move toward net-zero energy and water use. Since electric lighting consumes up to 60 percent of electrical energy in schools, maximizing daylighting in classrooms is a natural step that saves energy and improves the classroom environment. In order to reduce fossil fuel use, we can move toward heating and cooling systems that use direct solar energy as a heat source, and electric-powered heat pumps that can use energy produced onsite. We can use rainwater from the site to replace much of the potable water used for flushing toilets, and by recycling graywater and purifying blackwater, we can create a closed loop water cycle on campus. Our case study will be included in the web publication prepared by the California Division of the State Architect, which will be published soon at www.7x7x7designenergywater.com. For more information contact Amy Fisher at afisher@HAarchs.com.